Otibehia Allen is a single mother who lives in a rented mobile home in the same isolated, poor community where she grew up among the cotton and soybean fields of the Mississippi Delta. During a summer that feels like a sauna, the trailer's air conditioner has conked out. Some nights, Allen and her five children find cooler accommodations with friends and relatives. Other nights, they sleep in the trailer with box fans circulating the stuffy air. Allen works 30 hours a week as a data entry clerk and transportation dispatcher for a medical clinic, pulling in barely over minimum wage. She doesn't own a car, and public transportation is not widely available. To get from home in Jonestown to work or even to go grocery shopping about 13 miles (21 kilometers) away in Clarksdale, Allen often pays people for a ride — sometimes $20 a pop. "It's not easy raising five children alone," Allen said, fighting back tears. "No, you didn't ask me to have them, true. So, I chose to. So that means I'm responsible for these people." Persistent poverty shapes daily existence in this expanse of agricultural flatland that gave birth to the blues. Jobs are scarce. Schools struggle for funding. Tens of thousands of families receive government food aid and health insurance. Fifty years ago, Democratic Sens. Robert F. Kennedy of New York and Joe Clark of Pennsylvania toured the Delta and saw ramshackle houses and starving children. Curtis Wilkie was a young reporter covering the senators' tour for a Delta newspaper, the Clarksdale Press Register. At one stop, Wilkie recalled, "There was a little infant in a dirty diaper crawling around on the floor and eating rice — grains of rice that were on the floor that were dirty. ... Kennedy knelt by the child and didn't say a word, was stroking the little child's cheeks and his forehead." Mississippi's congressional delegation in 1967, led by Democratic Sens. James Eastland and John Stennis and Rep. Jamie Whitten, resisted federal funding for food programs and for Head Start, a preschool program that many conservatives saw as a threat to the state's white, segregationist power structure because it educated poor black children. Wilkie said the trip had an enormous impact on Kennedy, whose eyes welled with tears at the sight of the child: "No question that once he got back to Washington, he became a more passionate advocate for rural people." Kennedy ran for president in 1968. Moments after winning the California primary, he was assassinated. Mississippi's second-term Republican governor, Phil Bryant, was born to a blue-collar family in the Delta in 1954. He frequently says he doesn't want people to be dependent on government. Under his tenure, Mississippi's been one of 19 states rejecting expansion of Medicaid, the federal and state health insurance program for the poor, under the health care law signed by former President Barack Obama. Bryant, who supports President Donald Trump, says job creation is the best way to combat poverty. Since he became governor, Mississippi has offered incentives to attract two tire manufacturing plants — one is open, the other being built. Neither is in the Delta. Although opportunities have improved in the past 50 years, the Delta remains one of the most deprived regions in the U.S. 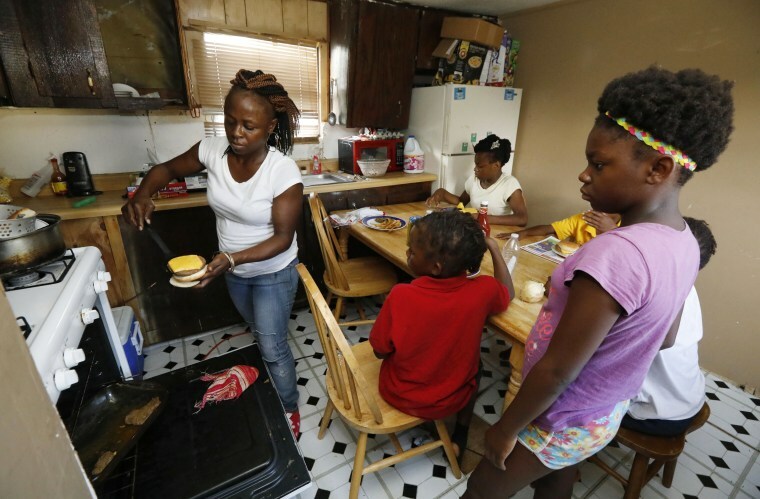 The national poverty rate is about 15 percent; it's 22 percent for Mississippi. In most Delta counties, it's 30 to 40 percent. Kennedy and Clark were accompanied to the Delta in 1967 by Marian Wright, a young civil rights lawyer working in Mississippi. In 1973, after she married and added to her name, Marian Wright Edelman founded Children's Defense Fund, a national group that advocates for social services for the poor. Edelman recently returned to Mississippi to examine how poverty continues shaping lives of people like Allen, the 32-year-old single mother. Both Edelman and Allen said they worry the Trump administration will cut social services that help the poor. In Allen's two-bedroom trailer, her boys sleep in one room, her girls in another while she stays on the couch. She buys groceries in bulk because it's cheaper, and she knows how far she can stretch a family pack of chicken from the Piggly Wiggly. Allen's children, 9 to 14, are covered by Medicaid. She got a raise a few months ago — 40 cents an hour, just enough to make her lose her own Medicaid coverage. Her back and arms are in constant pain, but she won't see a doctor. "I don't want to make a bill that I can't pay," Allen said. Dr. Barbara Ricks, a 49-year-old pediatrician, grew up poor in the Delta. Her family received food stamps; she attended Head Start and paid for college with scholarships and jobs. She has practiced medicine since 1999 in Greenville, one of the larger Delta cities — population 31,500. Ricks said about 95 percent of her patients are on Medicaid, some from small, rural communities 40 or 50 miles away because there are few clinics closer to home. She said patients from financially stable households generally are in better health than those living in poverty, who often deal with stress, obesity and diabetes. Concealing names to protect privacy, she said one of her patients is an 11-year-old boy with asthma who lives with his grandmother because his mom, single and unemployed, is overwhelmed raising his five younger siblings. He's been hospitalized because his grandmother, who also cares for an adult relative, leaves him "minimally supervised" and misses regular asthma treatments, the doctor said. Ricks said another patient is an infant whose mother is a 15-year-old student. Though the mother intends to go to college, she sometimes misses days or weeks of class to care for her baby. "Poverty is a social problem, but it's also a medical problem," Ricks said. "These kids have so many things working against them. And, although poor outcomes are expected, we should not accept it."